Speaking to an audience in Prague in April, US President Barack Obama declared "clearly and with conviction America's commitment to seek the peace and security of a world without nuclear weapons". He announced his intention to "reduce the role of nuclear weapons in (US) national security strategy and urge others to do the same". The president knows that these goals can't be achieved quickly or easily. But he is determined to take concrete steps toward his vision, and he accepts the US's responsibility to play a leading role. Obama regards the reduction and eventual elimination of nuclear arsenals across the world as a critical element of a strategy to reinvigorate the global non-proliferation regime and its centrepiece, the Nuclear Non-proliferation Treaty (NPT). In recent years, that regime has come under growing pressure, including as a result of North Korea's violations of and withdrawal from the treaty and Iran's defiance of UN Security Council resolutions. To shore up the regime, it is essential to strengthen, in a balanced way, each of its three main pillars: pursuing nuclear disarmament, preventing the acquisition of nuclear weapons by more states and promoting the peaceful uses of nuclear energy under international safeguards. Obama's ambitious agenda in nuclear arms control and disarmament includes negotiating verifiable reductions in US and Russian nuclear weapons, working closely with the US Senate to ratify the Comprehensive Test Ban Treaty, and pursuing a multilateral treaty that verifiably ends the production of fissile materials for use in nuclear weapons. Obama calls for reinforcing the non-proliferation pillar by giving the International Atomic Energy Agency (IAEA) the resources and authority it needs to perform its critical monitoring and safeguarding mission and by ensuring that there will be immediate consequences for countries caught breaking the rules or trying to leave the NPT without cause. No less important is bolstering the third pillar: promoting the peaceful uses of nuclear energy. Obama calls for building a new framework for civil nuclear co-operation so that countries can enjoy the benefits of civil nuclear energy without increasing the risks of proliferation. He holds that this "must be the right of every nation that renounces nuclear weapons, especially developing countries embarking on peaceful programmes. And no approach will succeed if it's based on the denial of rights to nations that play by the rules." To these three pillars should be added another critical goal - preventing nuclear terrorism. Some have regarded this as a concern for just the US and a few other countries, but not for everyone. This is a narrow and dangerous view. We are all the potential victims of nuclear terrorism, whether directly or not. 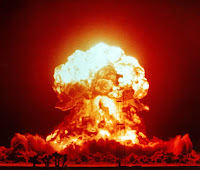 The detonation of a terrorist's nuclear bomb in any of the world's major cities would not only cause unprecedented suffering and destruction in that city; it would also have devastating consequences - economic, security, political, and social - in every corner of the world. That is why Obama believes that, within four years, we must secure all bomb-making nuclear materials across the world against theft or seizure - and why he will host a global summit on nuclear security in March to give high-level impetus to that effort. In the past, it was often assumed that reducing global nuclear dangers was a task that could be achieved by a handful of countries. If that was ever true - and that is doubtful - it is no longer the case. In today's highly integrated world there must be many more seats at the table, and those at the table must pull their weight in addressing these dangers. When it comes to today's nuclear threats, we are all in the same boat. We all have a vital stake in reducing those threats even as we take advantage of the civil uses of nuclear energy, and we all bear responsibility to do what we can to advance those goals. Too often in recent years, countries interested in addressing nuclear threats have acted as separate interest groups: as nuclear weapon states or non-nuclear weapon states; as countries with advanced civil nuclear energy programs or countries just embarking on such programmes; as the five permanent members of the UN Security Council or members of the Non-aligned Movement (NAM). If we are to succeed in the urgent task of revitalising the non-proliferation regime, we must bridge these divides, abandon outdated modes of thinking, and work together to seek practical solutions serving our common interests. Obama attaches special importance to reaching out to a diverse group of influential countries - to listen to them and learn from them. That is why he agreed with President Jacob Zuma at their meeting in Italy to establish dialogue on disarmament and non-proliferation, dialogue that will get under way in Pretoria this week. South Africa, guided by its knowledgeable and experienced ambassador to the IAEA, Abdul Minty, is a valued partner in efforts to bolster the global nuclear non-proliferation regime. As the only country to have built and then voluntarily dismantled all nuclear weapons and joined the NPT, it has unique credibility and moral authority. It is a leading voice in the NAM. It has been a driving force in making Africa a nuclear weapons-free zone (and deserves congratulations for the entry into force of the Treaty of Pelindaba just a few weeks ago). It has advanced civil nuclear energy capabilities. And it set an important example by bringing to justice black-market profiteers of the AQ Khan network. The US wants to work closely with South Africa in the run-up to the nuclear security summit and the NPT review conference in May, and continue this co-operation in the years ahead. Together, we can help lead the international community toward solutions that reduce today's nuclear threats while enabling all states to promote their energy and development goals by taking advantage of the peaceful uses of the atom. The security and well-being of the people of South Africa and the US - indeed of all countries - are at stake in how well we are able to co-operate in these efforts. Robert Einhorn is the special adviser for non-proliferation and arms control at the US Department of State. He is leading a US interagency team to Pretoria this week for the US-South Africa dialogue on disarmament and non-proliferation. I REFER to Robert Einhorn's insightful and useful piece on US President Obama's statement in Prague in April declaring "America's commitment to seek the peace and security of a world without nuclear weapons" ("Obama reaffirms his stance on nukes", The Star, August 27). Einhorn goes on to extol South Africa's future role in making the world a safer place, given that it not only manufactured several atomic bombs, but then voluntarily dismantled them, giving the country a unique moral authority with respect to disarmament. He raises the crucial role that South Africa played in drafting the Treaty of Pelindaba, which, as he notes, came into force in July, making Africa, and indeed the southern hemisphere, a nuclear weapon-free zone. It has taken 13 years after it officially opened for signature to finally come into force with the 28th deposit of its ratification instrument by Burundi on July 15. The treaty, which covers Africa as well as its islands, ensures that nuclear weapons are not developed, produced, tested or otherwise acquired or stationed in any of the countries on the continent. There is no doubt that the treaty confirms Africa's resolve to strengthen the global nuclear weapon-free regime and contribute to international nuclear disarmament and non-proliferation processes. The treaty includes protocols for the five nuclear weapons states to sign and ratify. To date, the UK, France and China have signed and ratified these, but Russia and the US have yet to ratify. By adhering to the protocols, nuclear weapons states commit themselves to respecting the status of the zone. Protocol I states that each protocol party undertakes not to use or threaten to use a nuclear explosive device against: any party to the treaty; or any territory within the African nuclear weapon-free zone for which a state that has become a party to Protocol III is internationally responsible. Under the Clinton administration, the US signed the protocol, but it has never been submitted it to the Senate for ratification; in fact, when signing it, the Clinton administration felt compelled to make it clear that its signature would not limit options available to the US in response to an attack by an African country using weapons of mass destruction. Protocol II to the treaty requires that nuclear weapons states refrain from conducting nuclear testing within the zone. Both US and Russian ratifications are still pending. The US has much to do; it should follow up on Obama's Prague speech by ratifying these protocols. This will send a clear message ahead of the review conference of the Nuclear Non-Proliferation Treaty in May that, like Africa, the US is committed to nuclear disarmament and non-proliferation across the world. In this way, to quote Einhorn, "we can help lead the international community towards solutions that reduce today's nuclear threats".